Imagine it’s a cold winter night in a 400-year-old city, and the only lights you see are candles placed inside paper bags (aka farolitos) and bonfires in front of some homes. 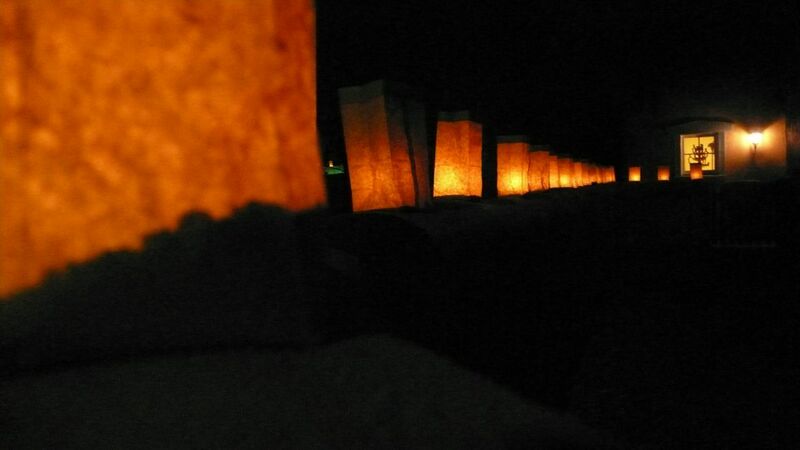 The glowing farolitos line the narrow streets and rugged adobe walls, while the crackling bonfires provide warmth, a distinctive holiday fragrance (thanks to the aromatic pinon logs) and interaction with fellow revelers. This is Santa Fe on Christmas Eve, and you’re here, walking around the city’s oldest neighborhood in your warmest coat, hat and scarf (not to mention your long johns), because this is what New Mexicans do. It’s a longstanding tradition rooted in religious practices (the farolitos are meant guide baby Jesus to shelter) that’s become an opportunity for Santa Feans and tourists alike to come together for strolling and caroling and, quite frankly, marveling at it all. Santa Fe is postcard pretty as is, but at night, by candlelight, with all the electric streetlights dimmed for the occasion, it’s magical. Artists have joined in on the Christmas Eve tradition by making Canyon Road, with its 100+ art galleries and studios, a featured stop on your stroll. 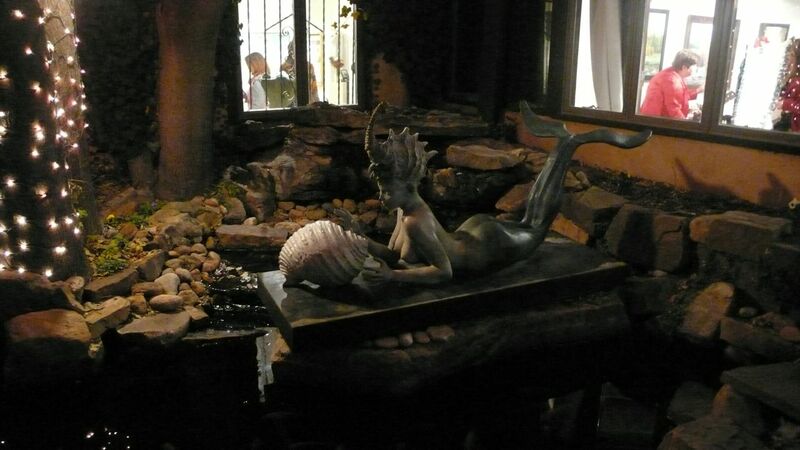 Most galleries stay open late and tempt you inside to see their latest collections with hot cider and cookies. (The lovely mermaid above was enough to get us into one shop.) Holiday music spills out of every doorway, and lighted sculptures and kinetic art call you over for a closer look. 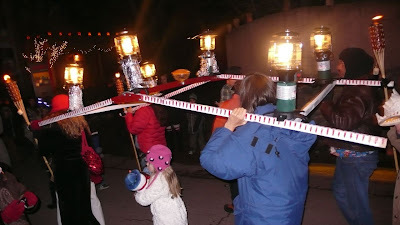 There are also roving bands of carolers and other curious processions (like the chariot built with camping lanterns pictured below) heading up and down Canyon Road, amidst the throng of people who’ve replaced the cars on this famous, winding street. For me, the festive scene on Canyon Road was certainly something to take in, but I most enjoyed wandering the quiet little lanes that branch off of it. You feel so far from modernity and all its loud and busy ways. Some of Santa Fe’s oldest homes are in this area, and being on foot, it was an unprecedented opportunity to peek in the windows and see what it’s like to live in a historic adobe (among the priciest real estate in town). 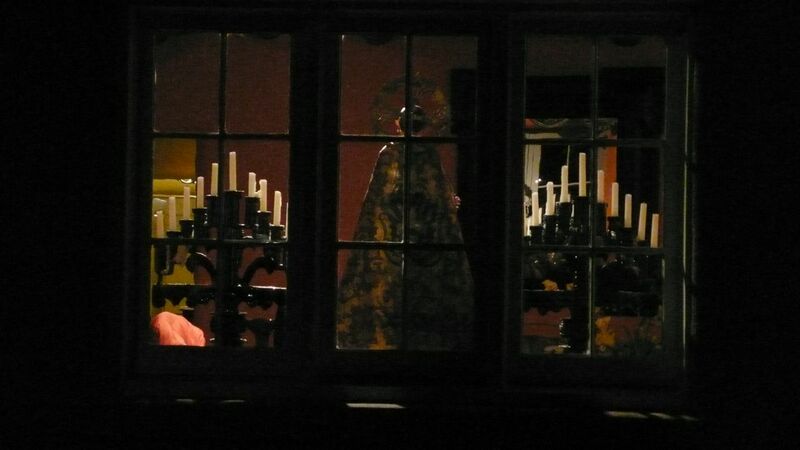 The shot below shows a glimpse of the extensive collection of religious art we spied in one home. In the stillness of the Canyon Road side roads, you also have the attention span to notice something else. The flying farolitos. Yes, believe it or not, an ingenious solar energy expert developed a way launch a kite-like version of the farolito, which rises comet-like across the sky until gets smaller and smaller and eventually burns itself up in a falling cascade of ashes. (Check out this YouTube video showing a flying farolito from “launch to loss” – forward to 1:30 to see it start to go up.) 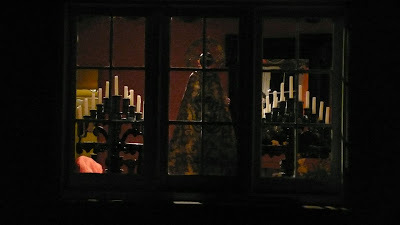 If you didn’t know about this little twist on the tradition, you would rub your eyes and wonder if you’d seen an UFO. But no. 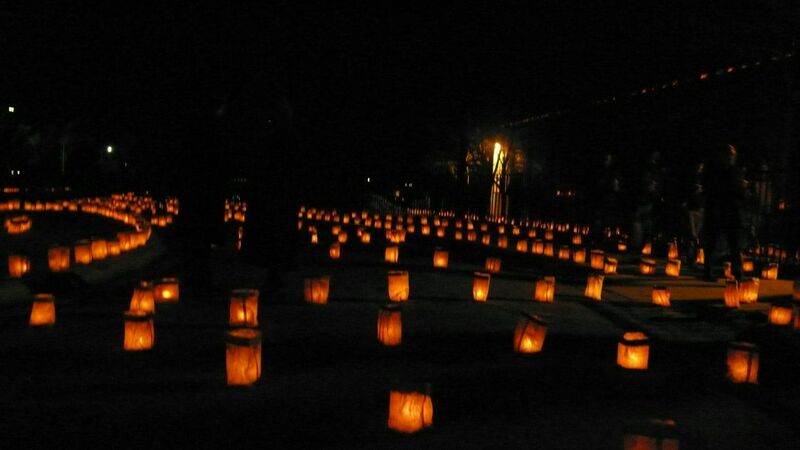 It’s just Christmas Eve in Santa Fe, a place like no other on a night like no other.